The Ministry of Oil, the details of the contract of drilling 40 wells in Majnoon Giant field in the province of Basra. 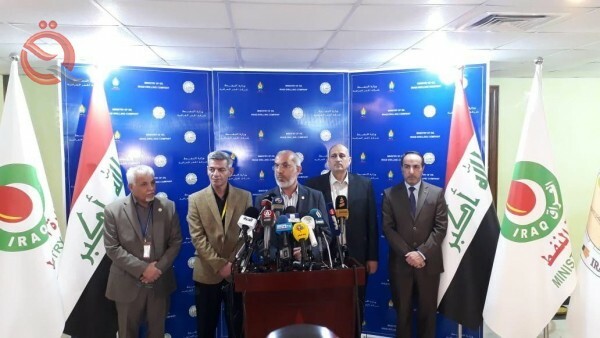 The director general of the Iraqi Drilling Company, Basem Mohammed Khudair, told a news conference in Basra and followed him "Economy News" that "the production ceiling of 24 months and reach the capacity of 450 thousand barrels of the field only Majnoon." He pointed out that "the work begins at the end of this year," noting that "the Ministry of Oil instructed the Iraqi Drilling Company to start work joint dialogue with neighboring countries." The Oil Ministry announced last Thursday that the Basra Oil Company has entered into an agreement with the state-run Iraqi Drilling Company to dig 40 new oil wells in the giant oil field of Majnoon in the south of the country. "This contract represents an important step for the development of oil fields with national capabilities through specialized companies, including the Basra Oil Company and the Iraqi Drilling Company," Oil Minister Thamer Ghadhban said during his attendance at the signing ceremony of the drilling contract. "The contract was signed between two national companies to dig 40 oil wells in the field of Majnoon oil, so the ministry will be able to develop the field and increase the production processes in record times and reduced costs and the efforts of loyal national staff in the Basra oil companies and the Iraqi drilling.